Fall Into a QAL Block 10 Release! | Sparkle On! Block 10 of the Fall Into a QAL “Patchwork Pickles” is designed by Sandra Healy of Sandra Healy Designs where you can read her tutorial and download the free pattern! This an appliquéd block with piecing. The background and jars are quick to piece, the pattern provides you with easy to follow directions. The jars are stored with carrots and pears, drawn by Sandra in her signature fun and whimsical style, that are appliquéd onto the block. I used a blanket stitch for my pears and raw edge stitching for the carrots. I used some sparkily thread for a few for some added fun. For my jar tag I had a moment of inspiration and decided to embroidery it with “Fall into a QAL 2018.” A perfect label for my jars and the whole quilt too! This was the first year I tried my hand at pickling. We had two cucumber plants with a much larger yield than expected. So, after eating and giving away (i.e. leaving on neighbors doorsteps ;) many cukes, we made “refrigerator pickles” with vinegar water, dill and peppercorns. They last for about two months in the fridge and are crisp and delicious! A perfect Fall treat. Do you can fruit and/or veggies? I’d love to your tips. Next year I plan to try my hand at the real deal, canning tomato sauce instead of freezing it. Fall is near! Last harvest for the summer; a Zinnia flower, tomatoes and pickled cucumbers. Please visit all of the QAL hosts to see this block in a variety of inspirational fabrics and to read their tips on making this block. Also, all of the hosts are available to answer any questions you might have when making your block. 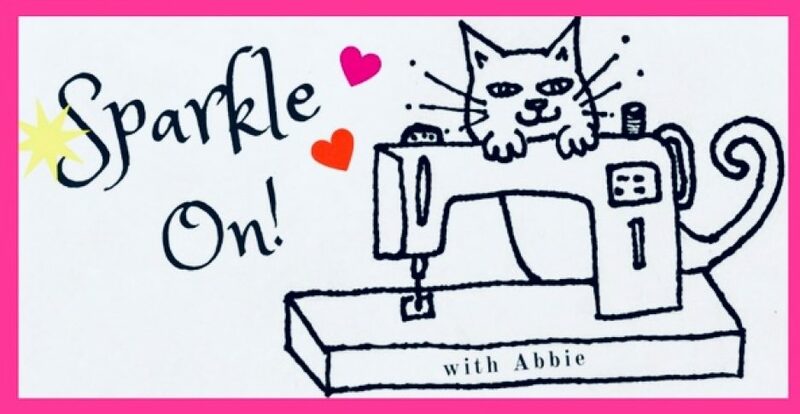 Abbie at Sparkle On! >>>You are here! a PDF pattern of your choice from Sandra Healy Designs. The linky party on Sandra’s blog. When you post a picture on our FB group page, Instagram and/or the designer’s linky party, you will be automatically entered to win Block 10’s prizes. For this QAL it has been my privilege not only to be a host, but a designer as well. I’m very excited to announce Block 11 is designed by me! and will be released on 10/02/18. Thank you to everyone quilting along with us. We are nearing the completion of the Fall into a QAL and it is a true pleasure seeing all of your wonderful quilt blocks coming together to make your finished quilt. < Previous Fall Into a QAL Block 9 Release! Next > Fall Into a QAL Block 11 Release! Yes, I can! I have jars and jars of chicken, quite a few of salsa, some jams, and have, in the past, canned almost everything that stood still. I do much less of it now, though. You will have great fun if you have good equipment. Thanks for showing your block. It’s so delicious! Hi Suz! Wow! Impressive and everything you make sounds yummy! I didn’t even know you can can chicken! This is the first year I had a “real” garden so now I have sn idea how much it produces and can’t wait until next year to can everything! That block is adorable! I love canning too. My best tip is to get some help — canning is the most fun when you are doing it with someone else! I’m just learning about all the different things you can can. I know, it’s hard to find that balance of making enough but not too much. I like the sparkily thread on the pears…one of my favorite fall foods. I just canned about 50 quarts of tomatoes; some for me and some for mom and Sandy! My canning tip: check to make sure you have all the ingredients before getting started…I ran out of salt halfway through my can-a-thon! Yowza, 50 quarts. That’s awesome! You all will have yummy tomatoes all year. The supermarket ones just don’t taste the same. Frustrating when you run out of an ingredient. Good advice, thank you! The tag is brilliant! This is going to be an awesome sampler! I did lots of canning in my younger years. These days, with being retired and doing more traveling, the garden is a thing of the past. I’ve learned to find local people who do the “work” and enjoy the fruits of their labor!!! Home grown is always the best. Love your blocks. I like to buy local canned food too, especially jelly! It’s wonderful you are enjoying your retirement! Love your block though the label wins my heart. Very creative! I love to can and there is nothing quite like canned tomatoes from the garden in the heart of winter. I put up a small batch last weekend and included my annual “caramelized onion and cherry tomato balsamic conserve” recipe – a must have for burgers and dogs! Thank you Patty 💕I agree, nothing is better than garden veggies all year round. I made some salsa & tomato sauce to freeze and thought about relish too. Your recipe sounds awesome, I’m going to google it now! Do you have an online one you use? So sorry that I’m only popping over now! For some reason your posts go into a separate folder in my inbox and I have to remember to go and check it every now and then! I love your glittery applique thread and your jar’s funky label, so fun! !